Great review for Nine Lives! I love this most recent review by Sherry and her blog fundinmental. She was very thorough and honest with her review but what I liked most was that it is apparent she got it! Sherry, you are the first reviewer to actually state what the book was fundamentally about, that pun is absolutely intended. She went into quite some detail, framing out the story. Starting out the story with my main character Michael Morino and his wife Jenny. I couldn't help but laugh with her humor explaining very briefly how he met her, drunk and she turned up pregnant. Okay, I suppose that synopsis wasn't EXACTLY what happened but it shows Sherry's style, her humor and that she was enjoying herself. I am happy she was because I was too while reading her review. Sherry did a great job in detailing the story. She went on to copy a few writings from Nine Lives which I really did enjoy. One of them I copied myself from the movie, Indiana Jones, “Snakes! I hate snakes.” I am sure I mentioned that in the book. I was having fun with my writing as any writer should. I love to listen to people who read my book and find out what parts they loved the best. Sherry quoted one line I forgot about but this one really made me laugh seeing it on her blog. “Look, why would I take a cat from the zoo and release him into the Wagon, only to kill the damn thing in a blender? Sounds like a book to me.” Made me laugh, even through the gruesomeness. The visuals she provided on her blog were outstanding! I loved the 66 Cobra Mustang but the creepy black cat was perfect. Another great picture was the fortune teller sitting behind the crystal ball peering into it and holding both hands around it. Yes, that was exactly how I imagined Zara in my story. Thank you Sherry for the wonderful review. You have a great blog and I look forward to sending you my next book for a review. You need to check out this blog! I wish I had time to write here tonight but I need to head out. I'll give my thoughts later but I wanted to give you a link to a fabulous person and her blog. 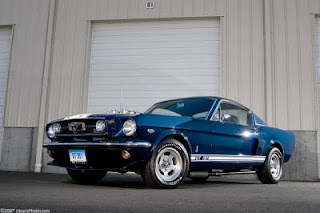 To start with, she is obviously a fan of the 66 Shelby GT because I found this beautiful picture on her website. Wow! Where did you find such an excellent image? I love the paint color. Fabulous! Tomorrow I'll post some of my thoughts but until then, check out Sherry's blog!